The USB Source RF Comb Generator (USB-S) was designed to provide real-world RF laboratory and field measurement teams a versatile broad-band comb generator source! 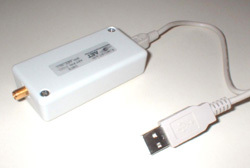 The USB-S is a unique product, a pocket-sized comb generator source that addresses many requirements in both the research and test community. The RF signal is internally generated by a stable Comb Generator (CG) and amplified to create a highly repeatable RF source. The family of comb generators allow users the flexibility to have any of the 4 fundamental frequency settings (1.8, 10, 64, 100, 133 and 200 MHz). The SMA connector allows quick connection either directly to test receivers and spectrum analyzer. Ideal as a RF source for daily high frequency measurement equipment checks, and with the optional low frequency pulser, is especially unique to provide laboratory assessment of equipment Quasi-Peak detector performance. Applicable to OATS, GTEMs, semi-anechoic or shielded rooms, and any standard or complex RF test environment.